Even if you weren’t in yachting in the late 1980s, surely you remember the scandal involving Senator Gary Hart and the megayacht Monkey Business. Hart was the leading Democratic presidential candidate in 1988 until rumors surfaced of an affair with a woman named Donna Rice. That, along with a photo of the two alongside the yacht, sank his campaign. The infamous incident is coming to the big screen, in the film The Front Runner. The film chronicles Hart’s rise as well as fall. At the time, stories alleging political candidates having extramarital affairs typically were ignored by the media. That did not happen with Hart, however. Historians and media scholars alike say the proverbial tide began changing during that period. In fact, the media coverage of the alleged affair was widespread. In early 1987, William C. Broadhurst, a Louisiana lawyer, chartered Monkey Business. He, Hart, and two women, one of whom was Rice, cruised from Miami to Bimini onboard for a day trip. According to Rice, they stayed overnight because customs was closed. She and the other woman reportedly stayed on the yacht. Broadhurst and Hart, meanwhile, reportedly stayed on Broadhurst’s boat, nearby. A photo revealing Rice sitting on Hart’s lap in Bimini, with Hart wearing a “Monkey Business crew” T-shirt, led Hart to withdraw his nomination. Filming for The Front Runner took place in Savannah last autumn. 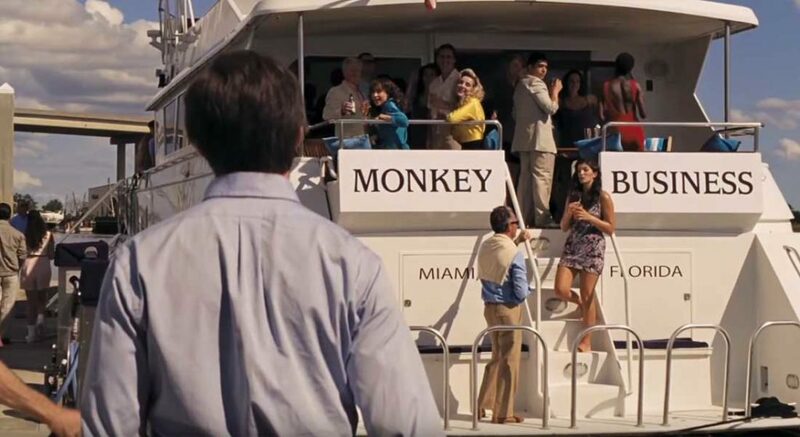 We’ve been unable to determine which yacht plays the role of Monkey Business. Regardless, the real Monkey Business was an 83-footer (25-meter) from Broward Marine. She launched in 1978, for Donald Soffer, who also owned the Turnberry Isle Resort near Miami. Monkey Business entertained guests, many being celebrities, at the resort. Interestingly, about a year following the political scandal, Soffer put Monkey Business up for sale. His captain told reporters that the notoriety hurt business. The megayacht failed to sell, however. The Front Runner opens on November 6.